Conventional ethernet networks require cables connected between the hub or switch and each device. This can be restrictive unless it is possible to hide cables away, and also how difficult it is to run a cable from the hub to where a particular PC is. An alternative way to network a number of PCs is use wireless networking. Wireless networks use radio signals to transmit and receive data. Each PC still has a network card installed, but the 'physical' medium used to connect the devices is now air!. In order to use wireless in your network, you require at minimum a Wireless Access Point and a Wireless Network Adapter. The WAP provides connectivity between your physical LAN and any wireless devices you have. Network protocols such as TCP/IP and NETBUEI function in exactly the same way over a wireless network as they do on a conventional ethernet LAN, and it is the WAP's task to convert the protocols so that they function on both mediums. WAP devices come in many variations, with some providing the Cable Modem Router/Switch functions in addition to the wireless connectivity.The following diagrams show some ways of adding Wireless connectivity to your network. Wireless LANs can support up to 11MBps with 802.11b connection speeds, and up to 54M or 108M with 802.11g but this is dependent on the distance between the two devices transmitting to each other and the thickness of any walls between the transmitting devices as well as other factors such as positioning of aerials and their power output. Quite possibly the easiest solution, whereby your router provides Internet connectivity for both your wired and wireless devices. If you are in the market for a router, and you can afford the extra few quid, I'd recommend one that supports Wifi, even if you do not have any Wifi devices. Yet! In the instance where you just want to add wireless devices to your existing network, then a separate Access Point is needed. This diagram shows the WAP device connected to the router, but it could quite easily connect to a hub instead. This concept is actually shown in the following diagram. This variation shows an Access Point employed with a Gateway PC (either Windows ICS or Linux iptables, for example), with the AP connected to hub along with the other LAN devices. Some Wireless network kit is shown below. 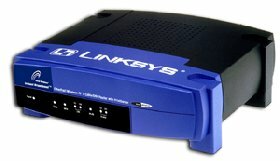 These pics were nicked off the Linksys website. 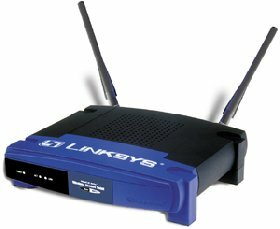 Other manufacturers such as SMC and D-Link also produce similar wireless network devices, just in case you thought I was recommending the Linksys offerings!. An example of a Wireless Access Point device. Wireless Network Card for a PC. Note that this is only a cradle for a PCMCIA Wireless card which would be an additional cost. 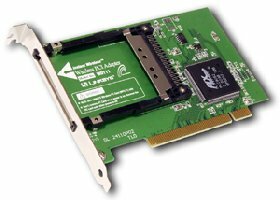 Wireless Network Card for a Laptop. Wireless networks are marvellously versatile, enabling a laptop, for instance, to be used anywhere in range of your WAP, and thence your network and, of course, the Internet. In the garden, in the bathroom, next door or whereever. The downside, however, can be that as you can connect your laptop to your wireless network, potentially others could too!. There are two methods available to help secure your wireless network. The first is to configure your WAP so that it will only communicate with known MAC addresses, and whilst this prevents others connecting to your network, it is possible for your network traffic to be 'sniffed' by any machines in range! The second method is to employ some sort of encryption on your wireless network. Most wireless devices support basic encryption which can protect your traffic. See the sections on Wireless Security and setting up a Wireless Access Point for further information on securing Wireless networks.